MHRD CBSE IIT JEE Mains Admission Notification released. JEE Main 2018 Notification & Information Bulletin On the basis of JEE Main, candidates are admitted to NITs, CFTIs and other engineering institutions. JEE Main 2018 is the popular engineering entrance exam in India.JEE Main is also the eligibility test for JEE Advanced which offers admission to IITs & ISM. From the year 2017, CBSE has introduced some new changes like applicants should have Aadhaar card issued by UIDAI for filling the application form. 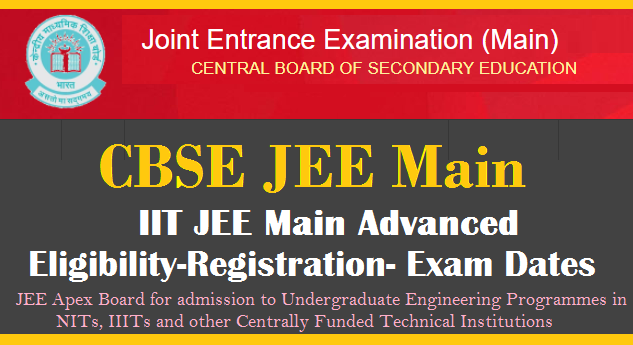 All candidates interested in pursuing a career in engineering can apply for Joint Entrance Examination (JEE). Students can get complete information about JEE Main 2018 such as application form, eligibility, exam dates, exam pattern and syllabus.Students can get complete information about JEE Main 2018 such as application form, eligibility, exam dates, exam pattern and syllabus. In pursuance of Ministry of Human Resource Development, Government of India, Notification, the 6th Joint Entrance Examination (Main) - 2018 will be conducted on 08/04/2018 (Sunday) by the JEE Apex Board for admission to Undergraduate Engineering Programmes in NITs, IIITs and other Centrally Funded Technical Institutions etc. The aspiring candidates have to apply online only through JEE (Main) website www.jeemain.nic.in. The online application process will start from 01st December, 2017 onwards. The last date for application is 01st January, 2018 and fee can be paid upto 02nd January 2018. Subjects: The qualifying examination must be passed/appearing with Physics, Chemistry and Mathematics subjects. No Minimum Marks: There is no minimum marks requirement in 12th examination for writing the JEE Main exam. However, candidates have to secure the passing marks. Passing Year: Those who have appeared and passed the higher secondary examination in 2016 and 2017 are also eligible to apply. Moreover, candidates appearing the final examination of 12th in 2018 can also fill the JEE Main application form. In case if candidate appeared the 12th examination in 2015 but not passed in 2015, passed in 2016 are also not eligible. Candidates have to fill the JEE Main application form via online mode only. Applications will be released from 1st December 2017. In addition to filling personal & academic details, candidates also have to upload scanned images of photograph and signature in prescribed specifications.